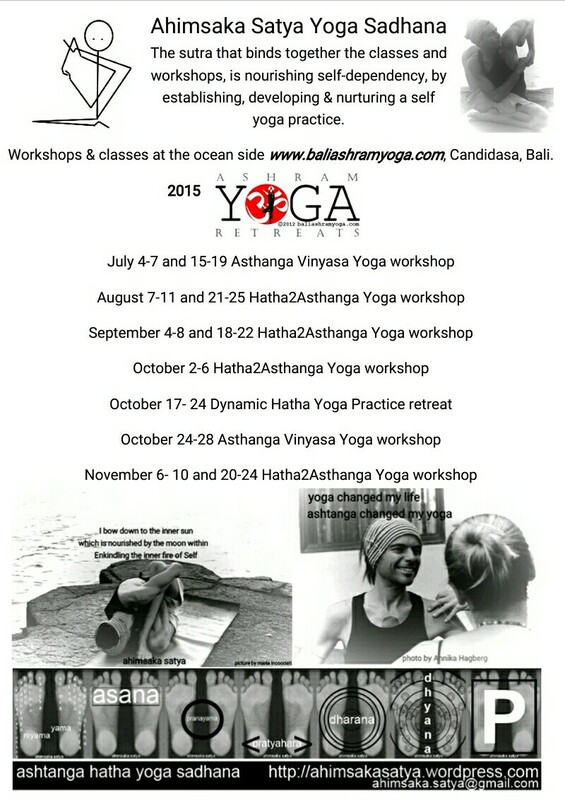 ashtanga & hatha yoga practices ; East – Timor & Bali. Lets set some positive intentions for the New Year by using the last day of the old year to reflect, and self-reflect. All morning classes are planned, also January first, but please give a 24 notice if you have the intention to join the class. Friday 4th of January no morning class. The Tuesday and Wednesday evening classes are cancelled and will be back next week. The 200hr yoga teacher training has started and a few more classes have been added to the schedule, for the most the schedule is as it was in 2018. The early morning weekday classes (@Uma Dame and Wednesday at @Ocean View)have as focus the self practice of yoga and lean towards the Mysore style of teaching. The weekend early morning classes at Ocean View are an extended variation of these classes in Led style. The Thursday evening 6 p.m. class is Ashtanga vinyasa yoga primary series for anyone that cannot make it to any of the morning classes . It is a Led style though can move towards Mysore style during the coming months. Interested in practicing Mysore but not sure enough to bring it to class, I m available for private sessions too. The Saturday 9 a.m. morning class @Ocean View is the best class to (re)start your yoga practice or to experience an all around balanced hatha yoga class. Sunday 9 a.m. morning class @Ocean View and Tuesday 6.15 p.m. evening class @U.N.D.P. give a complete practice too. The weekend afternoon special classes are both for beginners and the more experienced practitioner. It is about the interest to move deeper into a certain area of the yoga practice, let it be hips, core strength, focus, meditation and back bend. @Uma iis Tasi. We thank all our students for your continuous support. With your help we could support various organizations in Timor Leste that work in line with our yoga philosophy/business ethics and who contribute to the development of Timor Leste in a balanced, harmonious way. With your support we could also provide yoga classes to the less financial fortunate students. Many thanks and wishing you a blissful, peaceful and shining 2019. Dili Ashtanga Yoga offers various yoga classes, workshops ,yoga retreats at various locations around Dili . From Ashtanga vinyasa yoga (Mysore style & LED), Hatha yoga to yin yoga and anything in between. At the city center to beach locations. Primary series and beyond. Suitable for all levels. For anyone who is interested in the practice of yoga. The Mysore style of yoga teaching is unique to the Ashthanga Vinyasa Yoga tradition designed by Sri K Pattabhi Jois last century. It enables the student to practice (explore) a fixed sequence of yoga asana on her/his on pace by following external as well as internal guidance. External guidance would be a teacher, who assist with mostly hands-on adjustments and fewer verbal instructions, and the inspiration of the fellow students around. Internal guidance would be foremost the breathe, the internal dialogue and body intuition / intelligence. The student is not blindly following the instructions of the teacher but is activley present with the yoga sequence that is happening. The mind aswell as the body are involved in the sequence. Some days the body isn’t moving at all, other days the mind just seems totally out of it. It is here that observation of both body and mind takes place. Concentration, focus, preparation, calculation and observation are all qualities of the brain that need to be trained too. To remember which pose comes next requires some mental effort, and prevents the brain of zoning out into oblivion. It keeps the brain connected to the present, what is happening here and now. Mysore style of teaching puts more responsibility with the student and allows more space for the internal observation. It honors the diversity of the body, and let the student work with that diversity. The teacher is not instructing the student with which asana comes next; but allows the student to move through her/his practice and adjusting where necessary. The adjustment are mostly physically and directed directly to the body, to prevent ego involvement. Though the teacher will observe both body and mind, and will work on both to create space, strength and ultimately balance and harmony. The Mysore style of teaching goes hand in hand with the Ashthanga vinyasa sequences, though the style of teaching could be extended to any kind of sequence. As long as the student and teacher know which sequence is being followed, the Mysore style class could be functioning. Different sequences for different students to honor the diversity of the students. It requires intimate involvement of the teacher which her/his student practice and it asks from the student a commitment to the practice and an independent attitude. As a student you have to follow your inner guidance, using your internal devises to navigate yourself through the practice (and eventually life). The teacher is not there to tell you which pose is next and what to do, though will tell you when you forget. The teacher will guide you through the practice where it is necessary by letting you do your own practice. The body remembers by repetition, its the mind that’s label’s repetition as boredom. The mind likes to spin, to move in between opposites. When the body remembers stillness, it will ask for more. That is where the asana and vinyasa comes in, the effect of the asana plus the sequence is one of inducing stillness (how stimulating, energizing, aggravating or heating it may seem at first glance ). The body and eventually the mind will long for that stillness. From there chance will happen. Ahimsaka is offering every weekday the possibility of Mysore style classes from 6 a.m. to 7.45 a.m., at Dili Ashthanga Yoga, hosted at Dili Wellness / The upstairs Studio , Comoro road (opposite Leader, next to Harish and Dili Club). Please contact Ahimsaka first if you like to practice Mysore style. Ashthanga vinyasa yoga practice can benefit your running practice. “I cannot take a yoga class because I’m not flexible is like saying I cannot take a shower because I’m dirty “. As yoga isn’t about being flexible, actually not even about becoming flexible (though it is a beneficial side effect), it is about purifying the body and mind. Mosts sports start with “I can’t do that”. But after the initial start it moves towards the attitude of “I ran 5 miles, maybe I can ran 10 next time” or” I did 10 push ups, maybe I can do 15″. The reply to not able to do yoga would be;” you could when you start training”. Which coincides with the infamous saying of the father of Ashthanga yoga himself, Sri K Pattabhi Jois; “practice, practice, practice and all will come. Running will not make your physical practice of asana better, but yoga will definitely make your running better, physically speaking. As long as runners can make peace with that idea, it will make it a whole lot easier to move through 1st series ashtanga yoga for 90 minutes. You are bound to be tight, but without yoga you will only get tighter and probably experience more injuries. Both in 90 mins of ashtanga yoga or 90 minutes of running you will have to overcome the quitter’s mind. That during 90 minutes of either activity you are probably going to question yourself ; “What was I thinking to do 90 minutes of yoga/running.” Something is going to hurt, some posture, or mile is going to be brutal, and you might start to lose your motivation. When doing anything physical you are going to run up against that voice in your head that is the pessimist, the nay-sayer. This is where running and yoga are similar. They are both working on the mind, more than on the body. Your body can do just about anything it is the mind that is often the limited factor. When practicing / training 99% of the people are actually facing doubt, insecurity, worry, fear the “negative” self. The nay-sayer voice that around mile 16 tells you, “You can’t do it.”, is the same voice in yoga that will try to tell you you can’t come up out of a back drop either. The voice is the same, it comes from the same place and can be put to rest the same way no matter if it’s running or yoga. The yoga teacher, Tim Miller, likes to say “Experience is the remover of doubt.” Every time you run 5 miles, it erases the doubt that you can’t run 6. Every time you run 6, it erases the doubt that I can’t do 7. . The surya namaskars are equivalent to the first mile of any run you go on. It’s the warm up mile, where you find your legs and the rhythm of your breathing. The standing poses are equivalent to a 5k (3 miles), it’s enough of a run on a busy day. The seated postures, up to Marichyasana are equal to about 5 miles. Right in the heart of what are commonly called the speed pump poses in ashtanga there is navasana, bhujapidasana, kurmasana. These are like mile 6, where you start second guessing yourself, and this crazy idea of staying fit. Mile 7 of a 9 mile run starts to smooth out just a bit as you start thinking you’re in the home stretch. Just like the poses baddha konasana, upavishta konasana, and supta padangsthasana do in yoga. You might think backbends are mile 9, but they are only mile 8, you must save enough energy after backbends to complete your inversions and come in strong to savasana. Savasana is equivalent to the cool down after a long run. You don’t just sit down after a long run, or you will quickly stiffen up. You will struggle just to get your shoes off later, if you don’t incorporate a good cool down. Savasana is necessary and so is a good cool down walk after a long run. The rhythm of breathing, the rhythm of the legs and arms working together, and how the pessimistic mind doesn’t have to win out. Most runs and most yoga practices conquer negativity. Push through the rough spots and come out on the other end better for it. Staring down your inner self has a profound way of changing you. Running and yoga remove doubts by doing the things that you thought couldn’t be done. Running tightens you, Yoga will save you from injuries and even burn-out. It will also give your running longevity. Ashtanga yoga is an excellent tool for building strength, flexibility, reducing anxiety, and keeping a person fit. To give an inner focus which often lacked and increased body awareness. Running tightens and stresses the body; it can be harsh and jarring. Yoga strengthens the entire body; lubricates each joint; deepens and calms the breath; and, in addition to all the physical and emotional benefits, is a deeply spiritual practice that makes us more mindful and peaceful. Deep or diaphragmatic (as opposed to chest breathing) brings more oxygen deeper into the lungs, ultimately engaging the parasympathetic nervous system. When were are in “parasympathetic dominance,” the mind is calmer, the heart rate is slower, less stress hormones are produced, and perceived exertion decreases. In “Going the Distance”, (again in Yoga Journal, though this one is available to read online), Nancy Coulter-Parker writes about increasing athletic endurance—what she defines as “the ability to persevere”—with yoga, which made her feel strong and capable. Through her asana practice she became intimate with her breath, and learned what pushing too hard sounds and feels like. Before yoga she felt like her body was an inanimate object outside of herself. Something that, for better or worse, hung dispassionately from her head. Yoga has and continues to reintroduce and reintegrate herself to herself. Yoga helps athletes focus on what is going on inside the body. It is really good at honing that internal voice,” she says. And because Ashtanga is so physically challenging, she has been forced to cultivate the yogic practices of mindfulness, awareness and non-self. Yoga is not an athletic endeavor. It is much more, and in some ways, more difficult (much like the practice of maintaining self worth apart from achieving the full expression of a particular pose). So while runners should be mindful of the practice they choose, the lessons yoga has to teach any athlete are many. The yoga’s tradition of interconnectedness where all things—including running—are as divine (and yogic) as you let them be. Often, even our understanding of “concentration” is equated with a straining mental force. In meditation we begin to learn that real concentration depends on a light, delicate, patient kind of mental control, and in time this becomes an effortless, undistracted mindfulness. Both Ashthanga vinyasa yoga and running, or anything else with a repetitive rhythm (like just breathing! ), helps to enable that mind falling “into the moment”. Based on the post by Stand and face the sun, Posted on 11/15/2013 and other online articles. BoulderRunning.com, “Runner’s Best Friend – Downward Dog,” by Katrina Mohr. “Running Buddahs ” Christopher J. Hayden wrote and produced a 1992 documentary on the the monks of Mount Hiei and John Stevens wrote the book The Marathon Monks of Mount Hiei, published by Shambhala Publications.